A website is just the start. Web design is just the first step. to get your business moving forward? We Specialize in WordPress Design and Coding. Windows 7 doesn't handle clicking on applications in the task bar consistently. Microsoft's Windows 7 is 7th Heaven! We’ve moved to WordPress for our site content management. Why? WordPress provides… A wide variety of features, including pages and blogs Nice support for multimedia Powerful skinning to give us the look we want We’d love to see what WordPress can do for you! Curious? Give us a call. 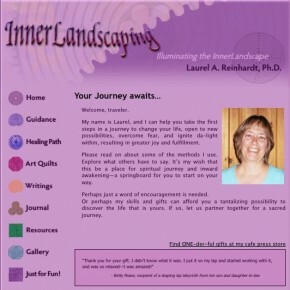 Laurel's work with Healing Path Quilts is stunningly beautiful, and she wanted a web presence that reflects that beauty and creativity. Our site features graphics by expert Paula Bishop, who has a style particularly suited to the artistic flair that defines Asheville. Contents copyright © 2010 Seventh Ridge IT Consulting and Web Design. All Rights Reserved. You may copy with credit and linkback. Seventh Ridge is TM Seventh Ridge, LLC.